The application has been designed keeping in mind the exact requirement of system managers. Steel Inventory helps you keep a good control over the IT assets you maintain. All the required features in the simplest form is our goal. Steel Inventory lets you take a snapshot of the original configuration and informs you when there is a change in the configuration either in Hardware or Software.Software installations and number of copies installed. Ultra simple Network Inventory. Track hardware and software inventory with ease. ...... there is a change in the configuration either in Hardware or Software. Steel Network Inventory assists you in tracking..
* Hardware configurations of all computers in the network. * Software installations and number of copies installed. * Hardware and software changes in the audited computers. * Generate detailed reports of hardware and software in one click. * Visual and email alerts on configuration change detection. * Scheduled audits of hardware, software, hotfixes, processes and shared resources. * Software license compliance with instant alerts. * Track hotfixes and patch installations in the audited computers. 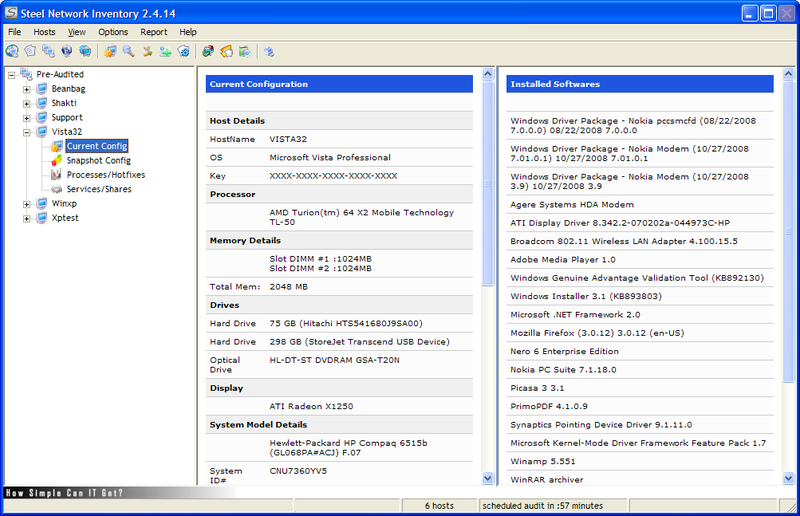 * Simple search mechanism for easy identification of hardware or software details. Qweas is providing links to Steel Network Inventory 2.6.18 as a courtesy, and makes no representations regarding Steel Network Inventory or any other applications or any information related thereto. Any questions, complaints or claims regarding this application Steel Network Inventory 2.6.18 must be directed to the appropriate software vendor. You may click the publisher link of Steel Network Inventory on the top of this page to get more details about the vendor.